1)Before you start,please styling your hair untangled and smooth. 2)Plug the appliance into a suitable mains socket wall power outlet(120V 60HZ 45W). 3)Press the ON/OFF button to turn the product on. 4)After 60 seconds, the temperature will heat up to 400℉, you will be able to start your hair style. 5)Place the magic curler in the middle part of the hair. 6)Grab a handful of hair into the magic hands, press the left or right buttons to make the curling iron convolute. 7)Hold on for 2-10s according to your hair condition. 8)Put the magic hair curler down gently, you can get a beautiful curly hair..
<1>It very perfect works with long hair. The shorter the pieces, the greater difficulty the curler can grab the hair and spin. <2>It should took some practice to get used to the application of the spinning action but that once you got the hang of it, it wasn't terribly difficult. 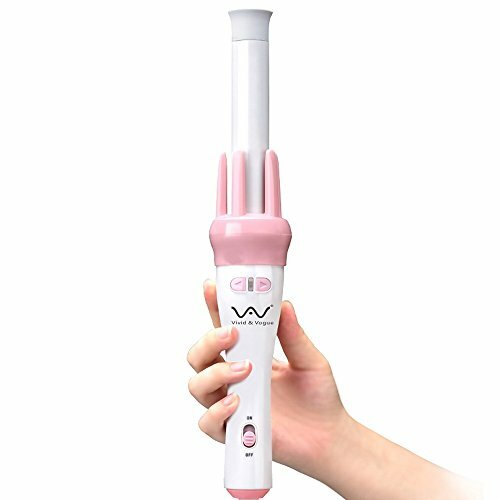 <3>If you are used to the traditional curler, than this will definitely take some time to adjust to with its spinning action. However, it does produce a good quality curl with plenty of bounce and some staying power. Tourmaline -ceramic ionic technology fosters healthy, shiny styling results with less frizz or damage.Full control over styling direction( curl dial creates left or right facing curls). Features a tourmaline ceramic coated 1" barrel at 4" of length. Fast heating up to 400℉ in 60S. 360 degree free swivel 1.8m salon power cord. One-year replacement, two-year warranty. NOTE: YOU MUST PAY ATTENTION TO THAT:<1>It very perfect works with long hair. The shorter the pieces, the greater difficulty the curler can grab the hair and spin. It should took some practice to get used to the application of the spinning action but that once you got the hang of it, it wasn't terribly difficult.<3>If you are used to the traditional curler, than this will definitely take some time to adjust to with its spinning action. However, it does produce a good quality curl with plenty of bounce and some staying power. If you have any questions about this product by VAV, contact us by completing and submitting the form below. If you are looking for a specif part number, please include it with your message.